What is the Council of Visitors? 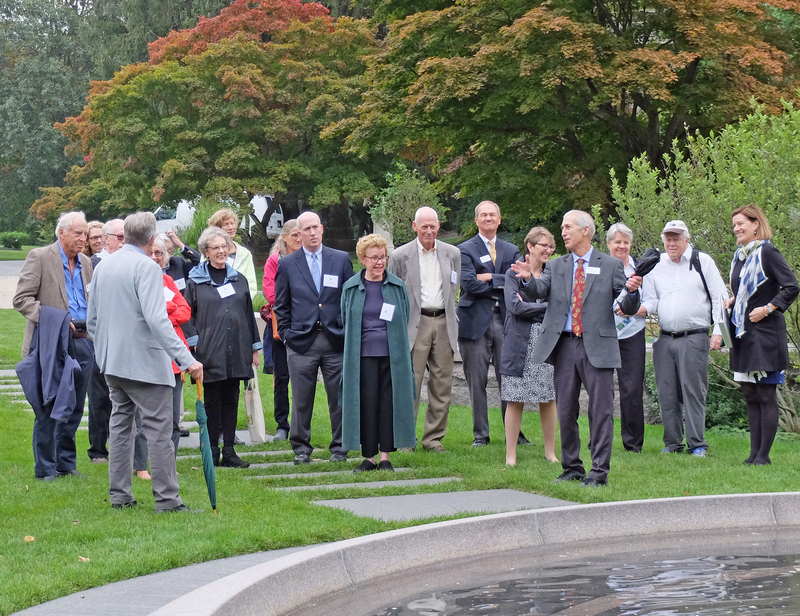 The Council of Visitors (COV) at Mount Auburn Cemetery is an advisory body, comprised of Cemetery friends, leaders in horticulture, landscape enhancement, historic preservation, wildlife, educational programming, as well as community leaders, dedicated to supporting and advancing Mount Auburn’s mission and highest standards of excellence. The Council acts as informed advisors on issues of strategic importance through active membership, and serve as a vital resource by volunteering leadership, expertise, and financial support. COV members also act as ambassadors and promote the interests of Mount Auburn Cemetery nationwide. Members of the Council of Visitors are selected and invited by Mount Auburn leadership to serve terms of three years. 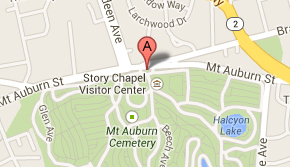 Terms are renewable at the discretion of Mount Auburn leadership. They are selected based on their individual interests, vision, special expertise, and dedication to the advancement of Mount Auburn. A Chairman and a Vice Chairman are elected by Cemetery leadership. The COV will receive regular reports on recent and upcoming major projects and new initiatives, financial conditions, fundraising reports, strategic plan updates, and other emerging topics. Members are encouraged to comment upon and advise on these and related matters. They are called upon by the Cemetery for informal advice or ad hoc assignments, and are invited to participate in occasional task forces and other special opportunities. While Mount Auburn invites, and welcomes, members’ philanthropic support, there are no giving requirements attached to the Council, nor are there any governance responsibilities. The COV meets annually for approximately one-half day in length. 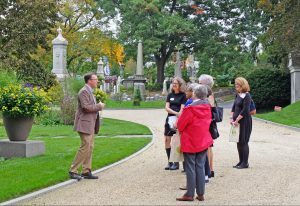 On October 11, 2018, Mount Auburn hosted its seventh annual Council of Visitors meeting. Participants braved a rainy afternoon to attend behind-the-scenes tours led by Artist-in-Residence Patrick Gabridge, Dave Barnett and Dennis Collins in Asa Gray Garden, and Educator-in-Residence David Morimoto of Lesley University. 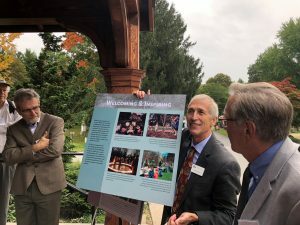 Following the tours, the renovation of Bigelow Chapel was the main topic of the day, with a keynote presentation by William L. Rawn III, award-winning architect and founding Principal of William Rawn Associates, discussing the firm’s work on the project design. 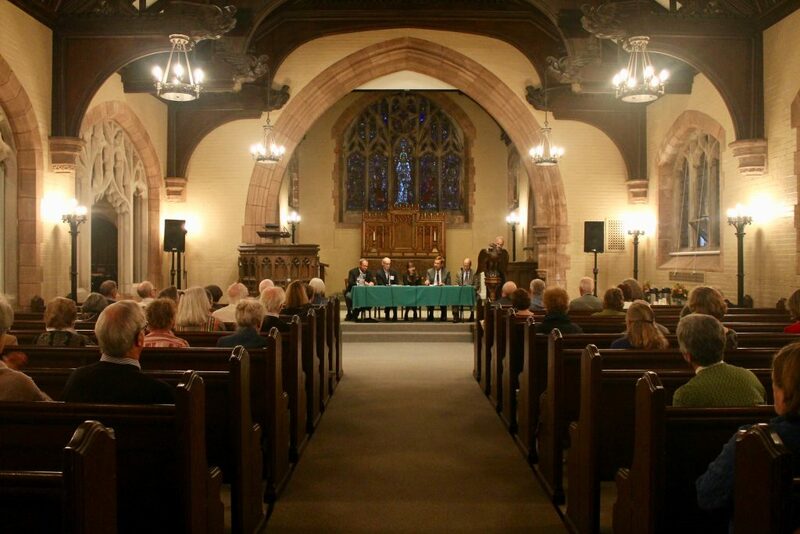 He was then joined by colleague Sam Lasky, Bree Harvey and Gus Fraser of Mount Auburn, and architect and Cemetery Trustee Jim Hunnewell for an in-depth panel discussion moderated by fellow architect and Treasurer of the Board of Trustees Sean McDonnell. For more information on the COV or joining this important group of ambassadors, please contact Jenny Gilbert, Director of Institutional Advancement at 617-607-1970 or jgilbert@mountauburn.org.